The reduced-cost membership will be available to residents with incomes below $35,000. CHICAGO — Divvy will begin offering low-income Chicago residents a discounted yearlong membership to the bike-sharing service, Mayor Rahm Emanuel announced Tuesday. The new program, "Divvy For Everyone," will offer a one-time, yearlong Divvy membership for $5 — instead of the normal fee of $75 — for residents with incomes of less than $35,000 and who don't have a credit or debit card, according to a news release from the city. A city Transportation Department spokesman said that "overage" fees — charged when Divvy riders take more than the allotted 30 minutes to return a bike — will be billed by mail (starting at $1.50) since the fees cannot be tied to a debit or credit card. Nearly 80 percent of Divvy members use the bike-sharing service to connect to public transportation, according to Divvy general manager Elliot Greenberger. "We’re excited to make Divvy more accessible to more working-class families, who often face a disproportionate burden of time or cost in their commutes," Greenberger said. Ald. Pat Dowell (3rd), who said she's been a "longtime advocate" of using bikes in Bronzeville, said she was proud to support Divvy for Everyone. The city is using outreach programs like Slow Roll Chicago and Go Bronzeville to spread awareness of Divvy for Everyone. “This effort, together with Divvy's expansion, will allow the system to serve significantly more communities of color and low- to moderate-income neighborhoods," said Olatunji Oboi Reed, Slow Roll Chicago co-founder and president. "We believe intensely in the transformative power of bicycles as a form of transportation. 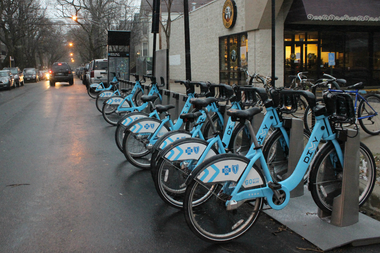 And we consider Divvy a public resource that all Chicagoans should have equitable access to." Divvy for Everyone is funded by a grant from the Better Bike Share Program, which was matched by Blue Cross Blue Shield. To receive the discount, go to a Local Initiatives Support Corporation Financial Opportunity Center in Bronzeville, Englewood, East Garfield Park, Humboldt Park or Ravenswood with proof of income and Chicago residency. You'll be charged $5 and receive your Divvy member key if you qualify. • Cara Program, Quad Communities Center for Working Families, 4655 S. King Drive, second floor. Open 11 a.m.-4 p.m. Mondays, Wednesdays and Thursdays and 10 a.m.-2 p.m. Fridays. • Metropolitan Families Services, 747 W. 63rd St. Open 9 a.m.-noon Mondays, Wednesdays and Fridays and 2-5 p.m. Tuesdays and Thursdays. • Central States SER, 10 S. Kedzie Ave. Open 9 a.m.-noon Mondays, Wednesdays and Fridays and 1-4 p.m. Tuesdays and Thursdays. • Center for Changing Lives, 1955 N. St. Louis Ave., No. 101. Open 2-6 p.m. Tuesdays and Wednesdays and 10 a.m.-noon Fridays. • Jane Addams Resource Corporation, 4432 N. Ravenswood Ave. Open 9 a.m.-5 p.m. weekdays.